A couple of years ago I posted a blog entry about our library’s many resources on the histories of the state’s colleges and universities. As the state’s institutions of higher learning continue to make their history more accessible, there is much to add to this list. Metropolitan State University of Denver is in the midst of a year-long celebration highlighting their 50th anniversary. A history page has been added to their website, including a timeline, photos, and an opportunity to share memories. Additionally, the January-February 2016 issue of Colorado Heritage includes a detailed article on the history of Metro State. 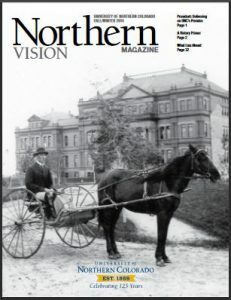 The University of Northern Colorado devoted the Fall/Winter 2014 issue of their Northern Vision magazine to exploring the university’s history. Formerly the State Teacher’s College, the university continues today with one of the state’s top teacher training programs. The issue is chock-full of great old photographs from the University Archives, as well as a helpful and detailed timeline. A history of Colorado State University’s (then Colorado State College) Extension Service is new to our collection since my last posting. This publication covers the period 1912 to 1941, the year it was published. Digital Collections of Colorado, hosted by the Colorado State University library, includes the repository for that institution as well as those from Colorado Mesa University, Colorado School of Mines, Colorado State University-Pueblo, University of Colorado Anschutz Medical Campus, University of Colorado Boulder-William Wise Law Library, and the University of Colorado-Colorado Springs. The CU Digital Library includes collections from the University of Colorado-Boulder and from the Auraria Campus, while CU Scholar is the Boulder Campus’s institutional repository for research and scholarship. More from Auraria can be found at Auraria Library Digital Collections. Digital UNC is the University of Northern Colorado’s repository. The site includes yearbooks, catalogs, photos, and other archival material. The author of the Colorado Heritage article on Metro State, referenced above, used many resources from the State Publications Library in her research. You, too, can view our library’s resources by visiting our website — here you can connect to our online catalog as well as our own digital repository.